Mahama on Sunday said there are many grounds for cooperation in a variety of fields, including oil and gas, agriculture, power generation and production of cement, home appliances and engineering products. 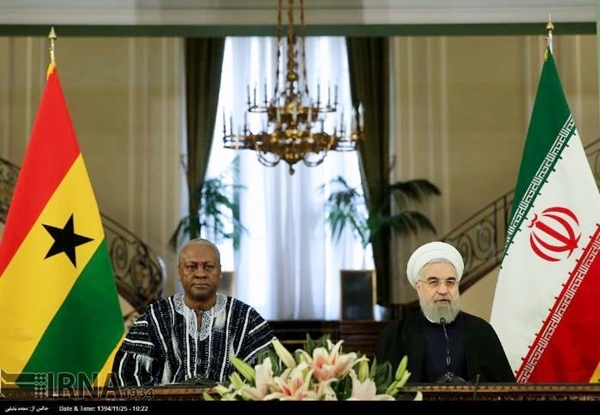 “We think Iran enjoys a good advantage in these fields and can become a suitable partner for Ghana,” he told a joint news conference with his Iranian counterpart Hassan Rouhani. He also thanked President Rouhani for “Iran’s educational support” and the fellowships which it grants to the Ghanaian youths to study medicine and engineering in Iran. Mahama said Iran’s establishment of an Islamic Azad University in Ghana had allowed the Ghanaian youths of all religious denominations, including Muslims, Christians and Buddhists, to carry on their graduate studies. “I also thank Iran for its agricultural services which it offers to poor and remote areas in Ghana which have led to better production and food security in these regions,” he added.